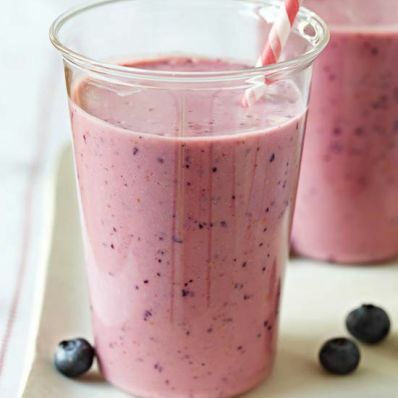 1 of 2 Combine bananas, 1 cup of the orange juice, the berries, yogurt, wheat germ and honey in a blender. 2 of 2 Cover and blend for about 1 minute, until all ingredients are mixed. While blending, pour in remaining 1 cup orange juice. Blend until smooth. Pour into glasses and serve. Per Serving: 19 mg sodium, 4 g fiber, 0 g sat. fat, 7 g pro., 42 g carb., 0 mg chol., 1 g Fat, total, 194 kcal cal.